HPA is taking the stand to eliminate any and all genetic defects possible. We want the HPA logo to stand for quality. The HPA is setting the standard for SUPER HIGHWAY BREEDERS. 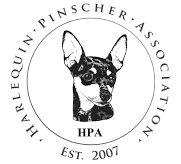 ​The HPA breeders are laying the dirt work for a Sound Foundation of Harlequin Pinschers. ONLY DNA VERIFIED AND GENETICALLY CLEAR stock will be allowed HPA registration.